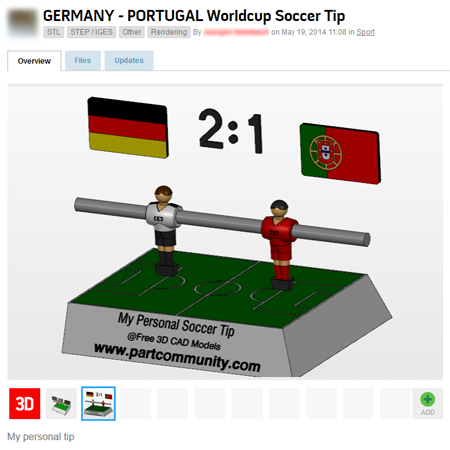 Share your 3D Soccer Tip in other platforms and win an orignal World Cup Football. Login to PARTcommunity and create your 3D Soccer Tip with the interactive configurator then share the downloaded model in other 3D platforms. After successfully uploading it post a screenshot into the group 3D WM Soccer Tips. It’s irrelevant if it is correct. All you need is this the “screenshot as evidence”. For each sharing action you are awarded points throughout the duration of the world cup.